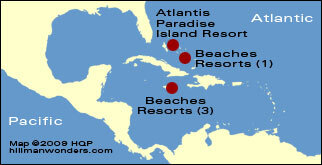 Locations: Jamaica (3 resorts), Turks and Caicos (1). 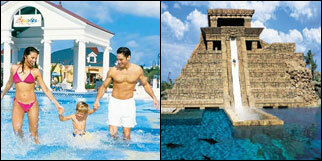 Beaches is a resort chain geared for families. It is part of the Sandals resort organization (the Caribbean's largest chain) and has a special tie-in with Sesame Street. Compared to the sizable Atlantis Paradise Island resort (see below), the individual Beaches resorts are smaller scaled and have more of a relaxed Caribbean look and feel. Although the primary focus of the 2000-plus- room Atlantis Paradise Island in Nassau is the adult guest, this mega-resort is also family oriented.&nbsp; It has many child- and teenager-pleasing activities, enough to keep children happily occupied. This resort specializes in family vacationers. FDR Pebbles is known especially for its nanny service. Every family is assigned its own personal nanny for the duration of its stay. This lets mom and pop enjoy beach and watersport activities on their own while the nanny looks after the playing children. FDR Pebbles is located on Jamaica's sunny north coast, between Montego Bay and Ocho Rios. Although the Club Med is most associated with the single mingling scene, it does cater to families as well in some of its resorts. In the Caribbean, it's the Club Med at Punta Cana in the Dominican Republic. Kids and teens enjoy the pool, sea, and watersports - and there will be enough other children around for making new friends. The left photo in my montage is copyrighted by Beaches and the right photo is copyrighted by Atlantis Paradise Island. Both are used with permission.